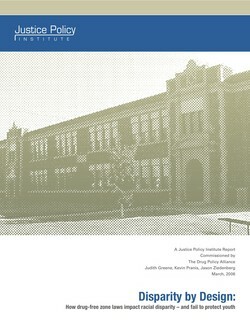 A new report coauthored by Justice Strategies analysts Judy Greene and Kevin Pranis, and Jason Ziedenberg of The Justice Policy Institute, finds that drug-free zone laws have no deterrent effect on drug sales near schools but instead fuel racial disparity in imprisonment. A stunning 96 percent of New Jersey prisoners sentenced under the state's drug-free zone laws are black or Hispanic. In Connecticut, majority nonwhite cities had ten times more zones per square mile than cities where less than 10 percent of residents were black or Hispanic. Several states, including Connecticut, New Jersey and Utah, are currently considering reforming or repealing drug-free zone laws. Laws that heighten penalties for drug activity near schools and other locations frequented by youth have been enacted in all 50 states and the District of Columbia. Yet until New Jersey's sentencing commission undertook an investigation in 2005, no state policymakers had taken a comprehensive look at whether "drug-free zone" laws in fact deter drug activity near schools, or what unintended consequences might result from casting wide zones around a long list of proscribed locations. Drug-free zone laws provide heightened penalties for drug offenses that occur within restricted areas surrounding schools, public housing projects, parks, playgrounds and other proscribed locations. The typical statute establishes a 1,000-foot zone (roughly the length of three football fields) surrounding schools and equal or smaller zones for other structures or locations. The size of the zone can vary from 300 feet to three miles. The penalties and penalty enhancements assigned to drug-free zone violations vary widely, but in many states they include mandatory prison terms. A Massachusetts study of drug enforcement in three cities found that less than one percent of the drug-free zone cases actually involved sales to youth. Analysis of hundreds of Connecticut drug-free zone cases identified just three such cases of sales to minors — all involving students arrested on school grounds. In Connecticut and Massachusetts researchers found that most of the sales occurred outside traditional school hours. Contrary to fears of drug dealers on playgrounds, Utah's Sentencing Commission found that most sales actually occur within a residence that simply happens to be located with in a zone. In New Jersey, sentencing commissioners could find no deterrent effect of the drug-free zone law. Fewer than one in 10 arrests takes place just outside the zones. Moreover, the number of drug-free zone arrests has risen since the law was enacted, rather than falling — as would be expected if drug sellers had moved their activity to avoid prohibited zones. New Jersey and Massachusetts researchers concluded that the size of the zones erodes their deterrent effect. The laws blanket densely-populated areas with overlapping zones and are frequently applied to transactions that take place in private residences, far from schools, and with no children present. In one instance, an Indiana man received an enhanced sentence for selling marijuana to a police officer in his second-floor apartment, simply because his building happened to be 950 feet away from the property line of the nearest school. According to Judge Barnett E. Hoffman, chair of New Jersey's Commission to Review Criminal Sentencing, "Giant unbroken drug-free zones...actually dilute the special protection the laws are supposed to offer." Communities of color are disproportionately impacted by drug-free school zone laws. Densely populated urban neighborhoods, where people of color are more likely to live, are blanketed by prohibited zones, while rural and suburban neighborhoods are less affected. In New Jersey, three-quarters of Newark, and over half of Jersey City and Camden, falls within a zone compared to just six percent of rural Mansfield Township. The result of this "urban effect" is what New Jersey's sentencing commission terms "a devastatingly disproportionate impact on New Jersey's minority community." In Connecticut — which has been ranked number one in terms of racial disparity in incarceration — cities where the majority of residents are nonwhite have ten times more zones per square mile than localities where less than 10 percent of residents are black or Hispanic. Unequal enforcement contributes to sharp racial disparities in incarceration rates. The racial disparity that results from the "urban effect" of drug-free zone laws appears to be exacerbated by disparate drug enforcement patterns. In Dorchester, Massachusetts researchers found that nonwhites were more likely to be charged with an offense that can carry a drug-free zone enhancement than whites who engaged in similar conduct. Blacks and Hispanics account for just 20 percent of Massachusetts residents but 80 percent of drug-free zone cases. In New Jersey, blacks in suburban and rural areas are far more likely than their white counterparts to be arrested and convicted of drug-free zone offenses. New Jersey devotes a larger share of beds to drug prisoners than any other state corrections system. Blacks and Hispanics make up just a quarter of the state's resident population, while they comprise 96 percent of prisoners serving time for drug-free zone offenses. National studies have found that whites, blacks and Hispanics use illegal drugs at similar rates, and also that most users obtain drugs from people with their own racial or ethnic background. Drug-free zone laws erode the constitutional right to trial by forcing defendants to plead guilty or risk long prison terms. At least half of the 46 individuals arrested in an infamous drug sweep in Tulia, Texas faced enhanced prison terms under the state's drug-free zone statute. In Washington state, prosecutors acknowledge that the principal function of drug-free zone enhancements is not to deter drug activity near schools but to "clear the trial calendar" and the data support that contention. Several states are reconsidering drug-free zone laws. Last year, Illinois legislators reformed their drug-free zone laws to remove a provision that required that 15- and 16-year old drug sellers be automatically tried as adults. Officials in four states proposed reforms to drug-free zone laws during the 2006 legislative session that range from reducing the size of the zones to replacing them with a more narrowly tailored law to protect children. Connecticut lawmakers proposed a bill (HB 5780) that would have reduced the scope of the zones from 1,500 to 200 feet and required postings to mark the boundaries. New Jersey's sentencing commission recommended that zones be narrowed from 1,000 to 200 feet — a proposal that enjoys the support of prosecutors and police chiefs — and a bill incorporating their recommendations was introduced (S 278). A bill to decrease Washington state's zones to 200 feet and limit the hours of application was introduced in 2006 and advocates expect the issue to return in the next legislative session. Finally Utah's parole board recommended replacing the drug-free zone enhancement with an enhancement for only those convicted of selling or manufacturing drugs in the presence of children. The report was coauthored by Justice Strategies analysts Judy Greene and Kevin Pranis, and Jason Ziedenberg of The Justice Policy Institute, and commissioned by the Drug Policy Alliance.